1. Paint your clothes pin with black and yellow stripes, the "head" should be black (it may turn out better if you paint the yellow stripes first, then the black). 2. Cut about 1" off from around the coffee filter. Once your paint is dry, paint on your bee's eyes and mouth with white paint. 3. 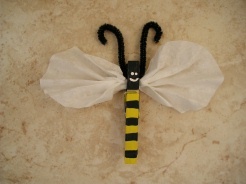 Scrunch up the coffee filter at the center and insert into the clothes pin to make the bee's wings. Use half of a black pipe cleaner (about 6"), bend in half and curl the ends to make the bee's antannea, insert into the clothes pin. Stick a self adhesive magnet onto the back. Great Job! You've made your first busy bee!